Kamala Harris campaign start for President gets thumb up from Donald Trump…. 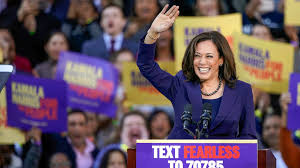 I don’t know if this is blessing or a curse…..
President Trump suggested Sen. Kamala Harris (D-Calif.) got a head start over other 2020 Democratic candidates so far, saying she had the “best opening” of any of her competitors. Harris’ campaign, which officially launched this week at a rally in Oakland, generated significantly more social media interest than those of her opponents, including Sens. Elizabeth Warren (D-Mass.) and Kirsten Gillibrand (D-N.Y.). ….